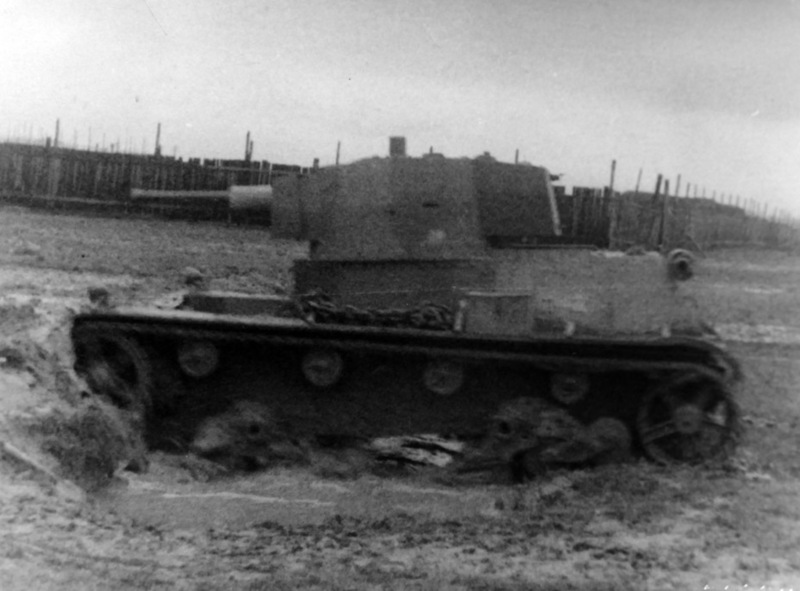 The Polish development of the Vickers Mk.E was not news for the Soviet military. Poland was considered one of the most likely opponents of the Red Army, and the interest of Soviet soldiers in Polish armour was easily explained. The 7TP became known in 1935, when the first tanks of this type were shown in a parade. Information that made its way to the USSR was not entirely correct. There was some confusion about the engine, for instance. Additionally, a Vickers Mk.E with massive air intakes that solved the engine overheating problem was deemed another variant of the 7TP. 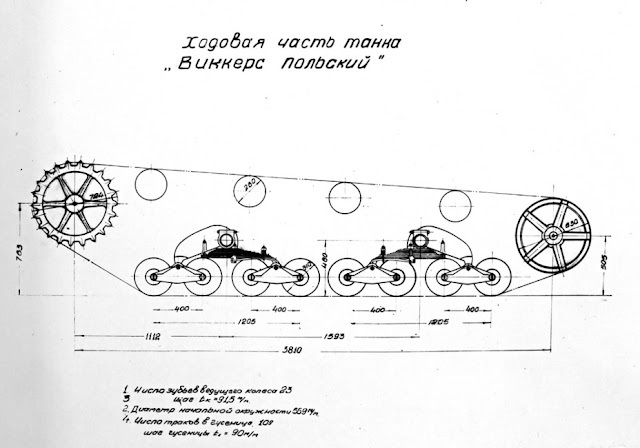 The USSR also knew about the C7P, a tractor on the 7TP chassis. Light 7TP tank after restoration. NIBT proving grounds, 1940. By the start of WWII, Polish armoured forces were very well known to the USSR. The level of information was second only to Czechoslovakia, with whom the USSR was working closely in military technology since 1937. Even though Poland was seen as the most likely enemy of the USSR, large scale fighting between the two nations never took place. By the time the "liberation campaign" started on September 17th, 1939, the war was already lost. When the RKKA went on the offensive the majority of the Polish army was engaged with the Germans in the west, but evacuation of government organizations and army units, largely through Romania and Hungary, was already in progress. This explains the low level of losses taken by the Red Army and low level of resistance in the east. There were, of course, some serious battles, but the appearance of Soviet armour in Lvov by 2 am on September 19th says a lot. These were tanks of the 24th Light Tank Brigade commanded by Colonel P.S. Fotchenkov. In Lvov they fought not with the Poles, but with the Germans, who were also entering the city. Both sides took slight losses. As for the Polish tanks, they never engaged Soviet armour. The horn and lights were missing, so Soviet-built replacements were installed. As Soviet tanks neared Lvov, the 10th Motorized Cavalry Brigade of Stanisław Maczek was fighting the Germans at Tomaszów Lubelski. A part of the brigade managed to break through towards the Hungarian border. 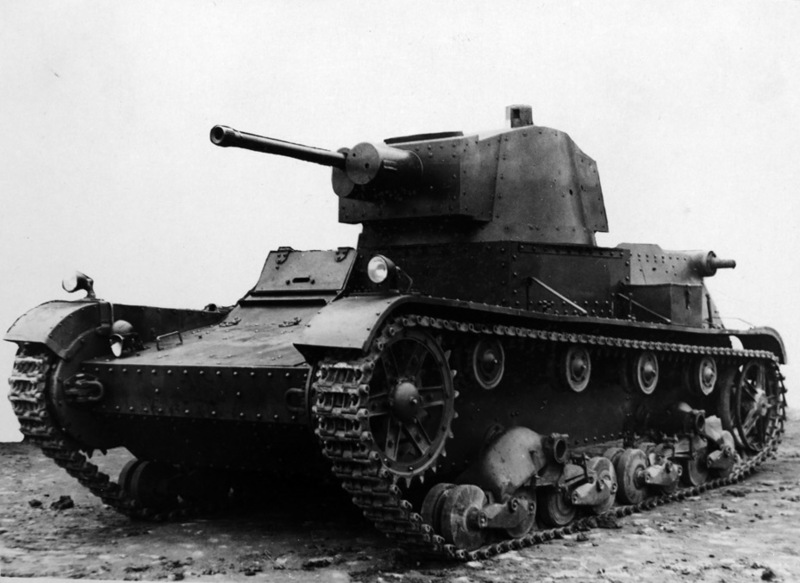 Hungary ended up with Polish vehicles, including TK-S tankettes, and the interned Polish soldiers later managed to make it to France to continue fighting the Nazis. The majority of the brigade was captured by the Germans. The Wehrmacht captured a number of Renault R 35 tanks that barely saw combat, as well as Vickers Mk.E, 7TP, C7P, and TK-S vehicles. They were gathered at a salvage yard at Tomaszów Lubelski. The vehicle retained its original camouflage. Germany and the USSR concluded negotiations on the division of Polish territory by October 5th. The Red Army began to retreat to the agreed positions, while carrying out orders regarding evacuation of captured equipment. An extraordinary raid was carried out as a part of these measures. The commander of the 24th Light Tank Brigade somehow found out about the salvage yard at Tomaszów Lubelski. On October 6th, a mobile force of 152 men was assembled to gather trophies. A raid by this unit returned with 10 Polish tankettes, 9 Polish and 2 German tanks (PzII Ausf.C), and 30 cannons. The Polish tanks included several 7TP and Vickers Mk.E. The serial number 5091 was written on the rear of the hull. This was the Red Army's largest "catch" until the start of the Great Patriotic War. Until then, only single samples were obtained. Since the target of the raid was a scrap yard, all vehicles required repairs. This was one of the reasons why so many multiples were taken. Captured Polish tanks were sent to repair base #7 (Darnitsa, Kiev). A number of the 7TP tanks and C7P tractors were sent from there to be studied. 7TP ##5057, 5091, and 5097, as well as C7P #1153 arrived at Kubinka. None of the tanks were runners, and it was decided to use up two tanks as donors of spare parts. A diagram of the transmission. The Soviets dubbed this tank "Polish Vickers". Tank 5091, built in 1938, was restored. Tank 5097 served as the parts donor, as it was more heavily damaged. Parts from this tank were also used to rebuild the C7P tractor. Unlike the PzII Ausf.C, which was only partially restored, the Polish tank was in complete and running order. This let the tankers carry out full mobility trials. 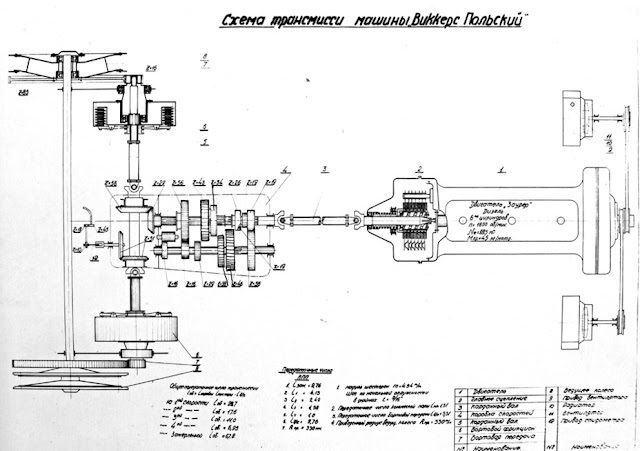 Individual components and assemblies were studied in detail, and diagrams were composed. The fact that there were multiples of some components allowed their retention as study aids. 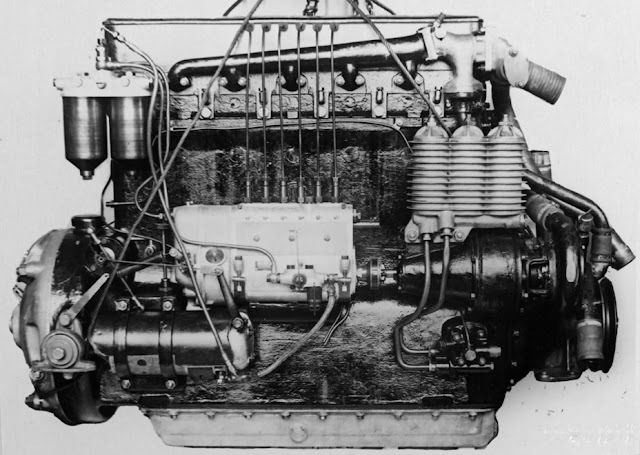 The Saurer diesel engine was the most interesting part of the drive train. Soviet specialists did not expect any fantastical revelations from trials of the 7TP. Restoration of the 7TP was complete by the summer of 1940, when study of a captured Finnish Vickers Mk.E was already underway. The Finnish and Polish tanks had the same turret and Bofors gun. Recall that the USSR was producing the Vickers Mk.E under license as the T-26 since 1931. An attempt was made to replace the T-26 in the mid-30s, but the T-46 turned out to be too complicated and expensive. 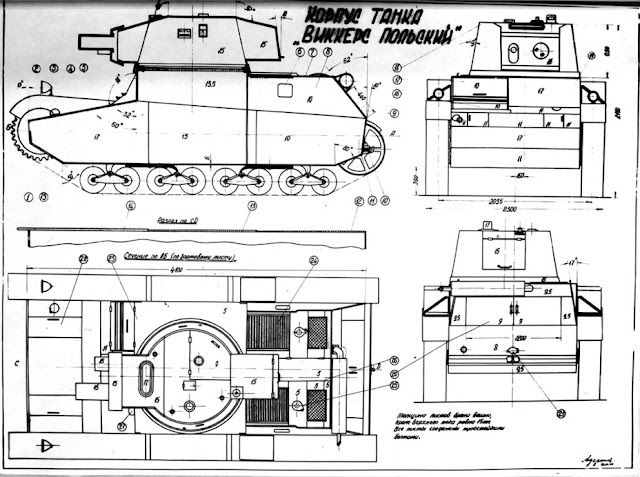 Modernization of the T-26 continued until the end of the 1930s. 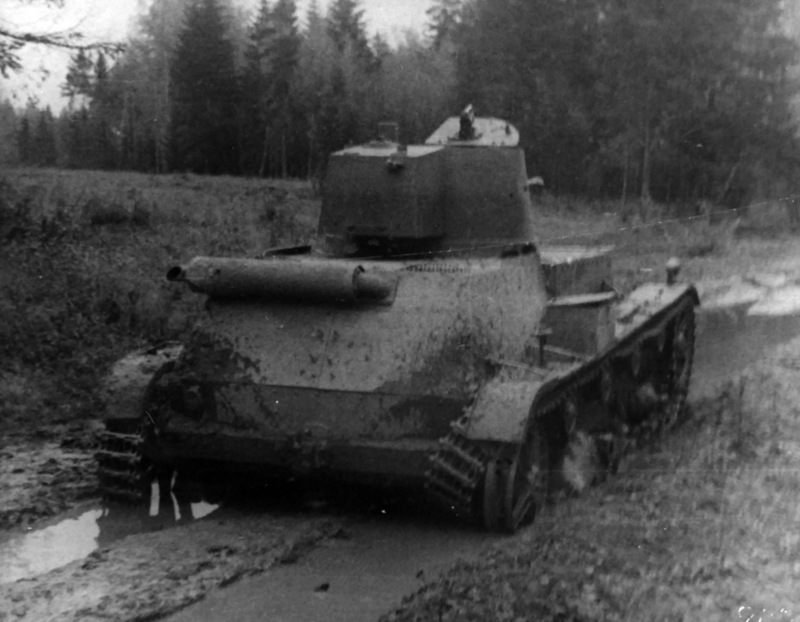 In 1940, a new SP tank program was launched to build a tank using lessons learned from the Winter War. It was clear that only individual components of this tank could be of any interest. The main friction clutch on the Polish tank. The most interesting component was the engine. The USSR was already familiar with the Saurer diesel engine. Since Saurer Dauntless trucks used the same engine, Soviet specialists easily established its origins. This engine was why the engine compartment of the 7TP was increased in size. This engine was interesting as the USSR was planning to equip light tanks with diesel engines as well. The Swiss engine was too big and too weak for this purpose, but the design itself was of some interest. 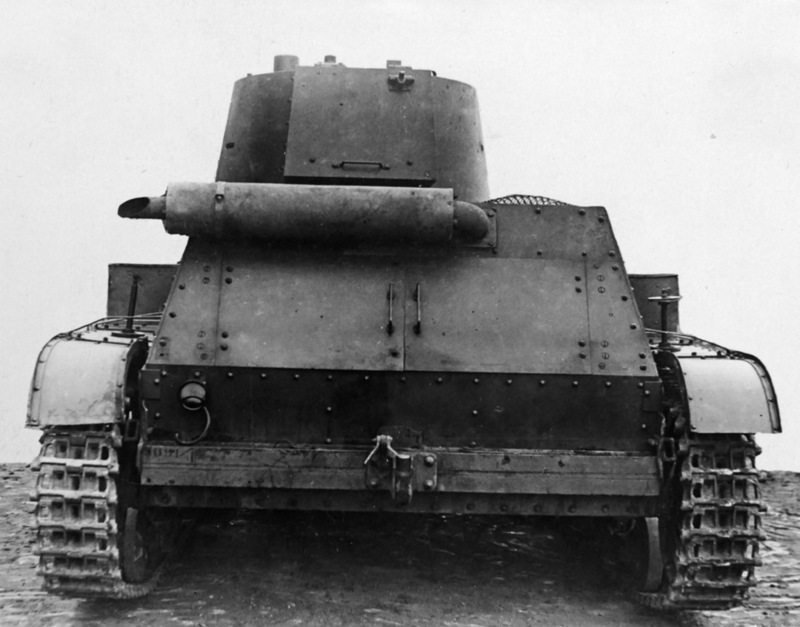 The 7TP was one of the first tanks with a mass produced diesel engine. 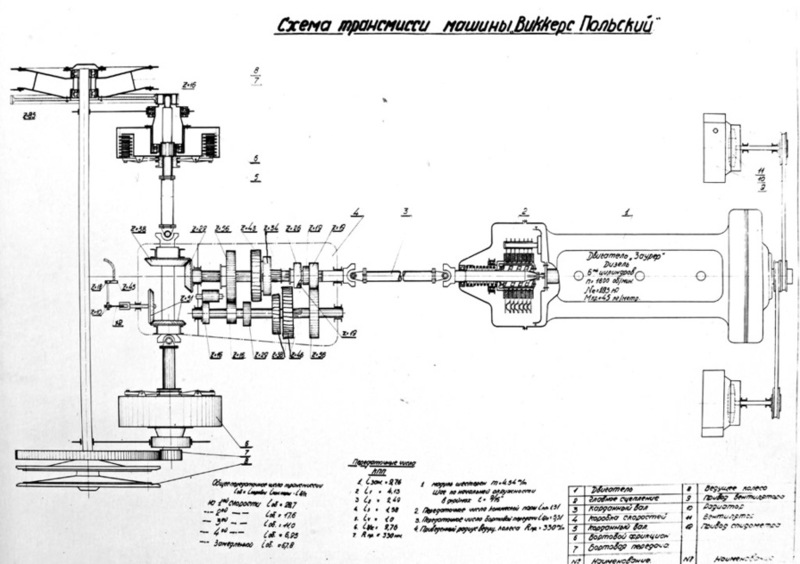 The USSR began working on diesel engines in the mid-1930s, but production began only in 1939. Another interesting aspect of the tank was the multi-disk dry clutch. The gearbox was similar to the one used on the T-26, but had a number of differences. One of them was the different gear ratios, explained by the tank's new engine. Diagram of the tank's running gear. The track links were also altered. They received new pins. The links were wider than on the Vickers Mk.E or T-26, 268 mm compared to 260, but they were also lighter. This reduced the ground pressure and made up for the increase in mass. The suspension of the 7TP was similar to what was used on the Vickers Mk.E and T-26, but it had its differences. The number of leaf springs decreased, and a rigid lever was added to reduce the pressure on the springs. The idler was reinforced in the same way as it was on the T-26. 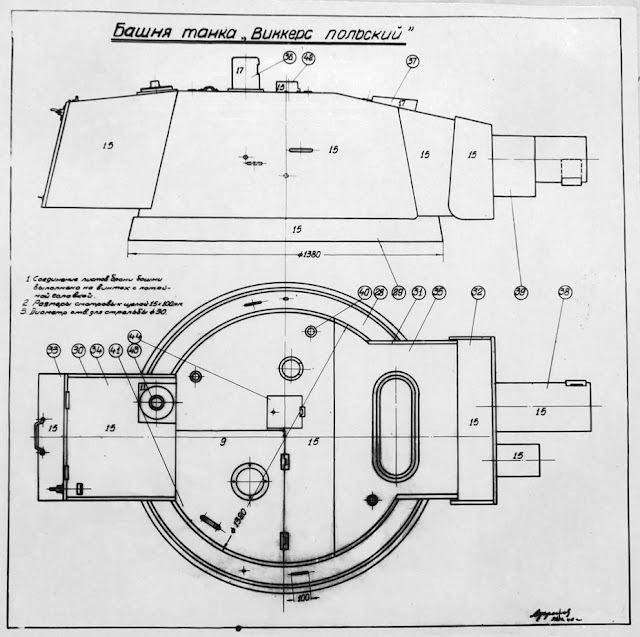 A diagram of the turret of the Polish tank. 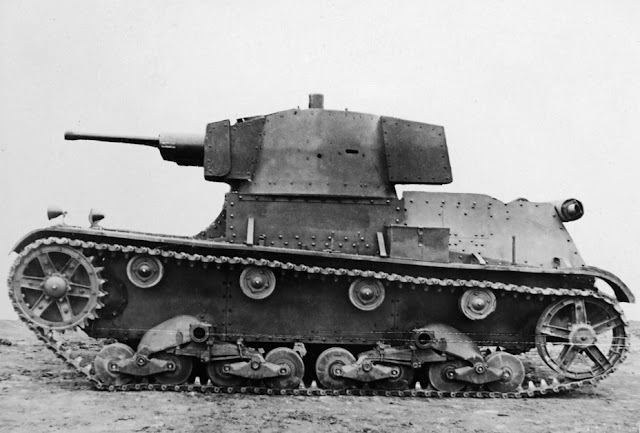 As mentioned above, the turret was similar to the one used by the Finnish Vickers Mk.E. Both turrets traced their roots back to the Bofors company. However, Polish engineers made a number of changes to their product. As a result, the Polish version was an improvement over the original. For instance, a ventilation system was introduced, which was a bonus in combat. The Polish gun mount was superior to its Swedish equivalent. The gun mount was also noticeably different. The overall concept that was initially designed for the Strv m/31 remained the same. 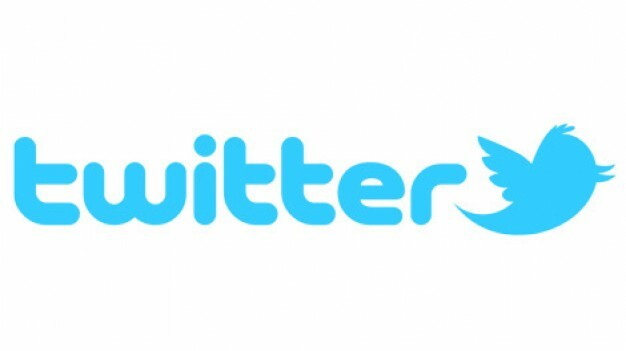 However, the Polish design was different from the Swedish design from the very beginning. The upper plate was simpler, which simplified production and reduced vulnerability to bullets. 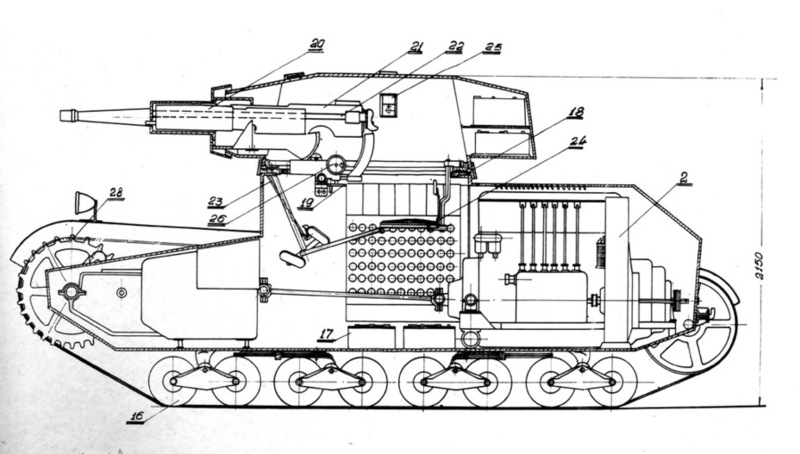 The gun mantlet was also simplified and fortified. The difference between the gun mantlet of the 7TP and the Finnish Vickers Mk.E was even more noticeable. Gun mount, view from the rear. Some of these changes were connected with the different auxiliary armament. The tank used the Ckm wz.30, the Polish variant of the Browning M1917, instead of the Schwarzlose M.07/12. This machinegun was slightly larger, and therefore the mount (including the mantlet) had to be redesigned. Otherwise, the gun mount was similar to what Bofors designed for the Strv m/31. The roof of the 7TP turret. 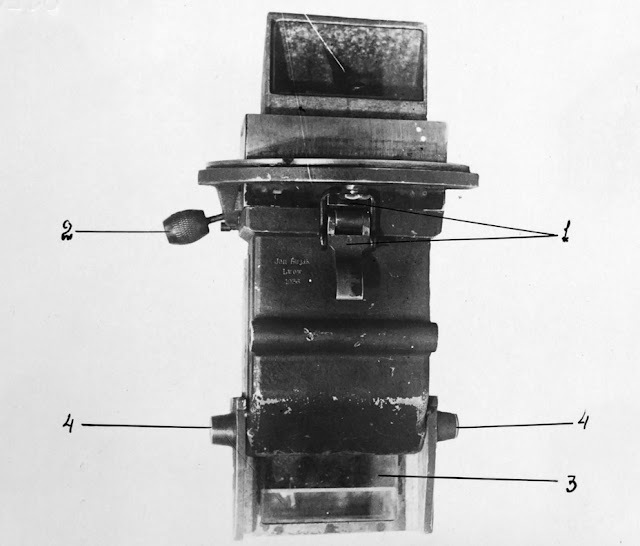 1 indicates the commander's periscope, 3 indicates the loader's periscope with an armoured cover. The Finnish tank had a large hatch in the center of the turret, the Poles shifted theirs to the right. This hatch was similar to the one used on the Strv m/31. It was not installed right away: initially the crew entered the tank through a two piece hatch in the rear. The new hatch was introduced at the same time as the turret bustle, which housed the radio. The Polish tank significantly surpassed the Swedish one in observation. 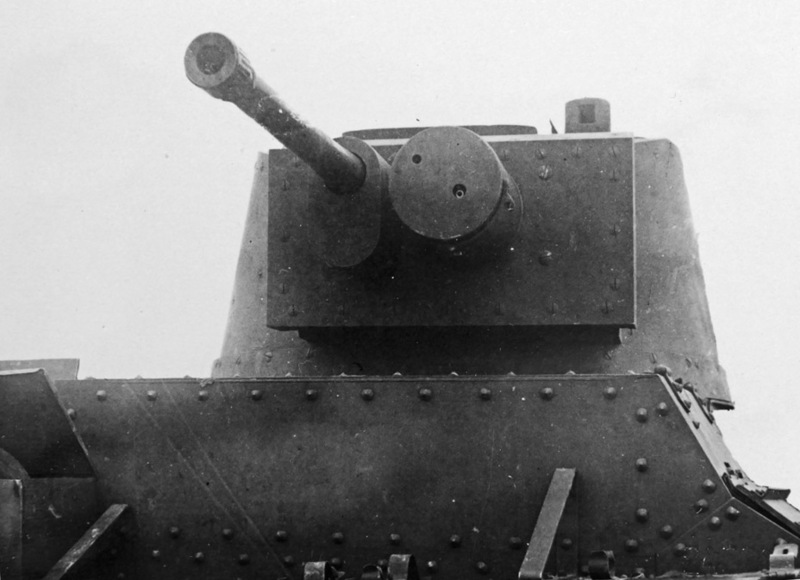 The Swedish tank had fairly simple observation devices to each side, plus two periscopes in the roof. This was inherited from the German Leichttraktor, whose turret served as the starting point for the Bofors design. As for the Polish tank, it had a much more sophisticated design. Instead of simple armoured glass, the tank had prismatic observation devices on its sides, which made it impossible for a bullet to strike their user. The tank captured in Finland also had prismatic observation devices, but slightly different ones. The periscopic device that the Polish gunner used was far superior. A rod connected it to the gun, and it doubled as a periscopic sight. The sight was not completely intact, but its design was of great interest to Soviet tankers. The tank under study did not have a telescopic sight. Soviet specialists considered it auxiliary. The periscopic device best known as the MK-IV caused the greatest interest. It was developed by Rudolph Gundlach, and built by the Vickers company under license. Periscopic observation devices were nothing new, but Gundlach's design was revolutionary. The device was simple and compact, allowing for 360 degree vision. Its prism was made up of two components (plus an additional prism for looking backwards). If the upper half was damaged, it could be quickly replaced without leaving the tank. The simple and comfortable observation device spread across the world. However, the USSR did not adopt it right away. Soviet tanks only received an analogous sight in 1943. It was copied from the observation devices of the Churchill IV, hence the Soviet name for the periscope: MK-IV. 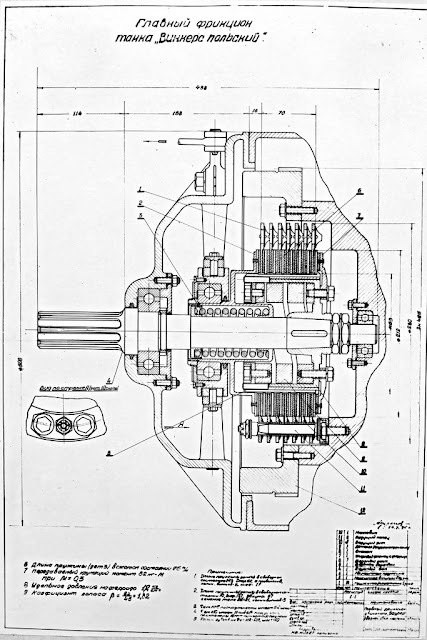 Cutaway diagram of the 7TP. 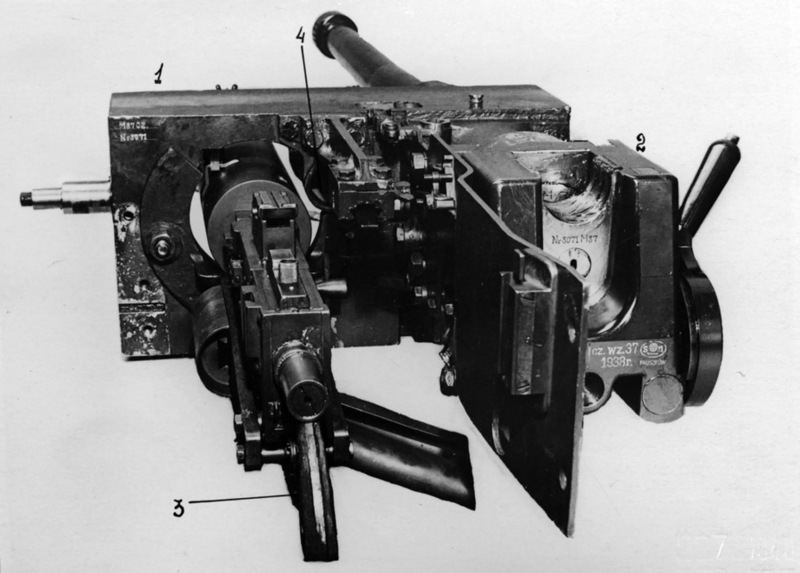 As on the Finnish Vickers, the ammunition rack was on the side. Polish designers had a better layout, thanks to which the ammunition capacity grew from 50 to 70 rounds. However, this was still smaller than even on the radio variant of the T-26. On the other hand, the majority of the T-26's ammunition was stored on the floor in cases, where it was inconvenient to access. A thrown track during trials. The T-26 had a similar problem. Mobility trials were performed after the tank was restored and a technical description was composed. Trials took place from October 7th, 1940, to October 11th. The tank drove for 312 km, 135 on a highway, 118 on dirt roads, and the rest was spent on special trials. The top speed achieved was 34.7 kph. This was a little lower than what the T-26 could achieve in the same conditions, 38 kph. However, the average speed of the 7TP was higher: 25 kph compared to the T-26's 23.8 kph. The cruising range was 195 km. This was greater than the Vickers Mk.E, but less than the T-26 (269 km), since the T-26 had larger fuel tanks. However, the Polish diesel engine consumed less fuel. The advantages of the diesel engine showed themselves on dirt roads. The average speed of the 7TP was 17.2 kph, compared to the T-26's 15.5 kph. 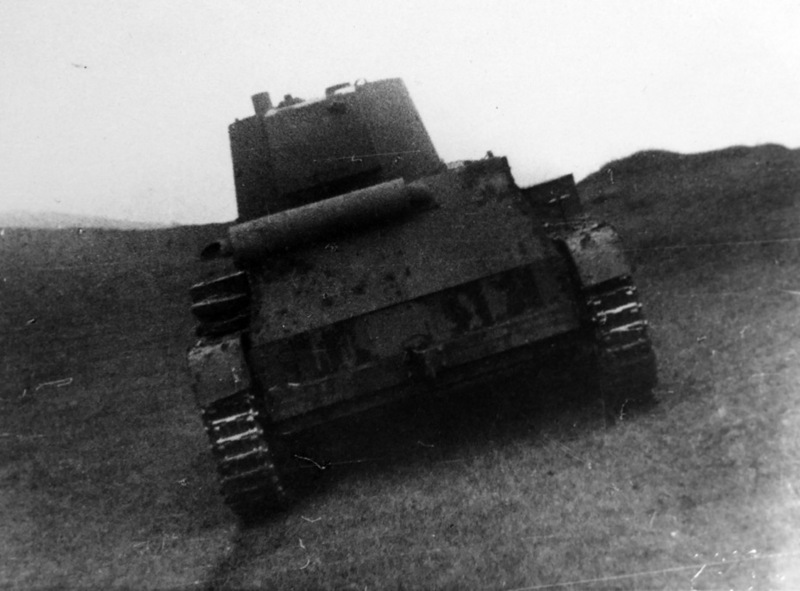 The range of the 7TP was 130 km in these conditions, and the range of the T-26 was 159 km. Consider that the 7TP carried 110 L of fuel, the Vickers Mk.E carried 180 L, and the T-26 290 L! It is not surprising that the Soviet tankers also wanted diesel engines. The difference between the Polish and Soviet tanks in weight was low (9.5 and 10.5 tons respectively). The maximum tilt angle was 20 degrees. The maximum grade the tank could climb was 32 degrees, after which the tracks started to slip. The track traction was also the limiting factor when driving at a tilt. Due to traction issues, the tank could not cross a 1.6 m wide trench. The T-26 did not do any better. The suspension of the Vickers Mk.E had its limitations, which is why the American Light Tank T2's suspension was replaced with one that had large road wheels. A 1.6 m wide and 0.5 m deep trench was too much for the tank. 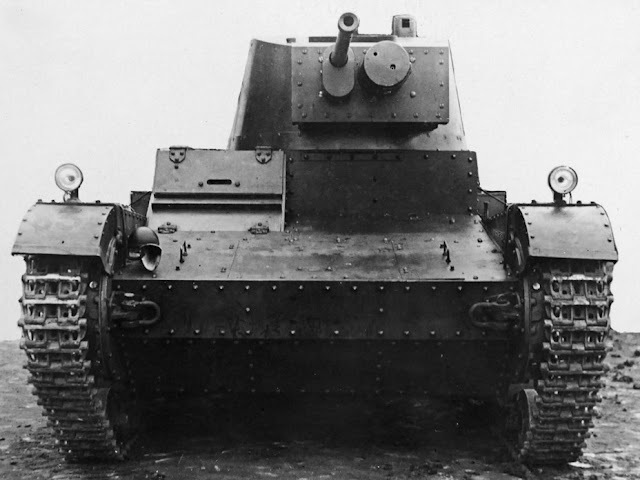 Unlike the Japanese Ha-Go tank, which Soviet specialists described negatively, the 7TP was received neutrally. Yes, its design was yesterday's news, but Soviet tankers did not consider it bad. The observation devices received praise, the improvements to the suspension were noted, and the quality of the workmanship was pointed out. The design of the clutch was also considered interesting. In addition to studying individual components and assemblies, the NIBT proving grounds also studied the armour of the Polish tank. Thanks to the presence of several vehicles of the same type, large scale studies could be performed, which included firing trials. Polish designers improved the armour protection of the tank compared to the initial Vickers Mk.E. 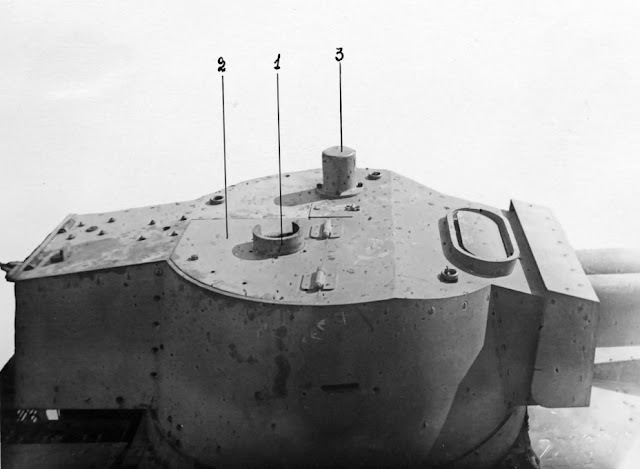 The thickness of the front of the hull and front of the turret platform increased to 17 mm. A part of the plates were homogeneous, and some were cemented. This protected the tank reliably from rifle caliber bullets and noticeably decreased the vulnerable distance for high caliber machineguns. The cost of this was thinner armour around the engine compartment, 10 mm. The thickness of the turret armour was 15 mm. The stripped down hull of tank #5057 was fired upon by light and armour piercing bullets from a Mosin rifle, as well as 12.7 mm bullets from the DK machinegun. Trials showed superior resistance compared to the T-26. The front plate could be penetrated by the DK at 100 meters. 15 mm thick armour could be penetrated at 200-250 meters. Trials showed that the gun mantlet is not jammed when fired upon. This was an achievement by Polish designers, but the issue was that the German army did not widely use high caliber machineguns. The 7TP most often came up against the 3.7 cm Pak, which could easily deal with 17 mm of armour. Trials of the 7TP turret at the Mariupol branch of NII-48. The DShK 12.7 mm machinegun also only went into mass production right before WWII. Before 1939, the tankers of the potential enemy would likely run into 45 mm anti-tank guns on the battlefield. 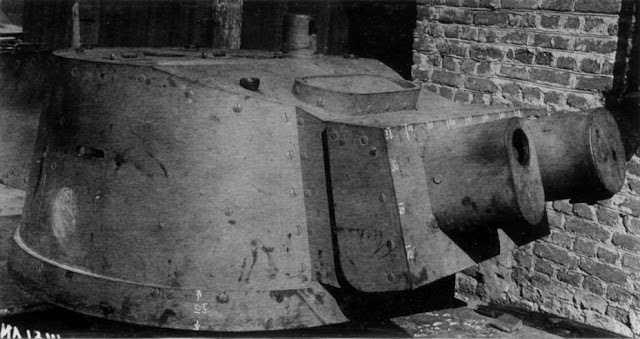 The turret of the Vickers Mk.E before trials. British armour was of lower quality than Polish. 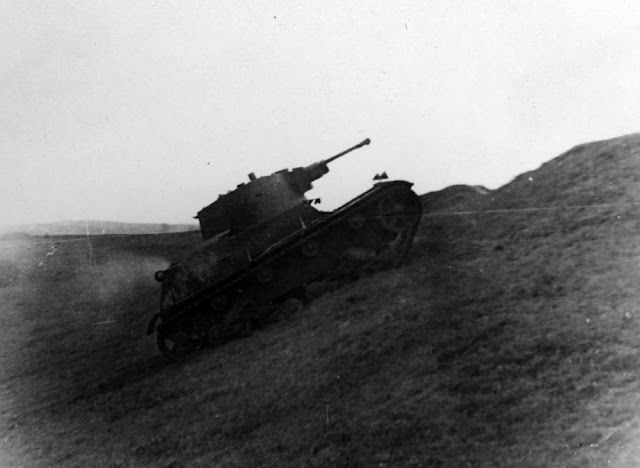 The NIBT proving grounds was not the only place where Polish tanks were shot up. The NII-48 branch in Mariupol tested 7TP and Vickers Mk.E turrets. Testers evaluated the quality of Polish armour as high. 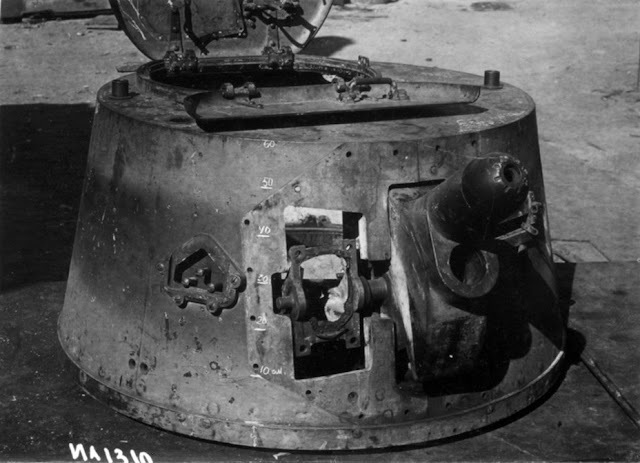 The quality of armour plate and joints of the Vickers Mk.E turret was lower. When fired upon with the 45 mm gun, British armour cracked. Unlike British armour, Polish armour did not crack. 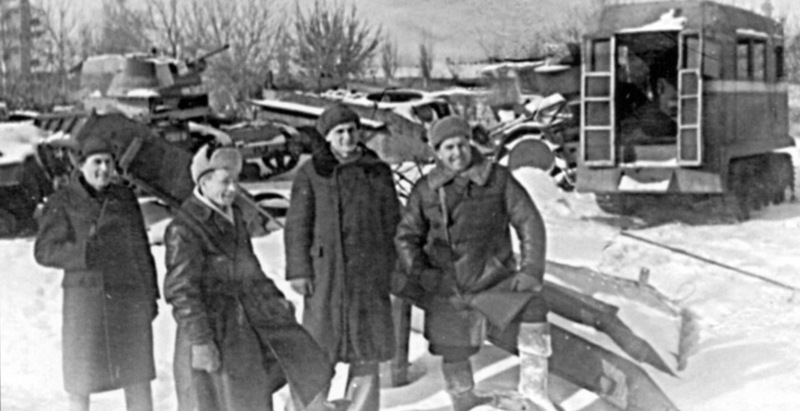 7TP in Stalingrad, January 1943. It's possible that this is one of the tanks captured in October of 1939. Tanks ##5057 and 5097 were scrapped in early 1941. The remaining 7TP and C7P were sent to storage. In April of 1941 it was decided that they would be sent to a museum. Their subsequent fate is unknown, perhaps they were sent to one of the city's organizations. Photos exist of a 7TP with Polish camouflage at the Stalingrad Tractor Factory. In addition, remains of a C7P tractor were found in Volgograd. 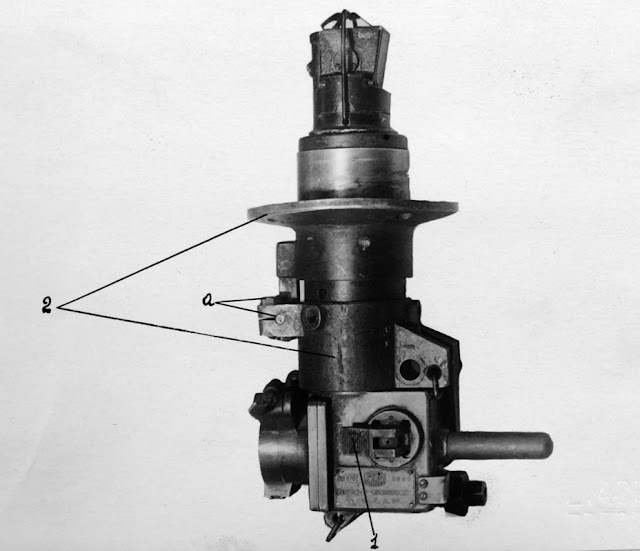 A model of a T-26 was built with these parts, with a BT turret mounted atop this "centaur". Today this tank can be seen at the Poklonnaya Gora museum in Moscow.